This week I am sharing with you a great group of people who really showed how to celebrate in style at Governors Estate Eleuthera. So 4 of the group had stayed with us before – but this time they filled the houses – 8 in the Yellow House, 6 in Sweetcorn House and 4 in Tops – 18 in total…. 16 of the 18 guests – the birthday girl Celine and her husband Jerry – organizer supremo – are 9th and 10th from the left….. They rented vehicles from Stanton Cooper – 2 large Suburbans and a Jeep but also had another large vehicle from Stanton to transport all the luggage from and back to the airport. Car full of luggage ….. They hired the lovely Stephanie Mariscal on my recommendation to cook for them for 3 nights. Stephanie makes delicious food, is a lovely calm presence and leaves your kitchen cleaner and tidier than it was before !! Stephanie is the person who now makes the meat free lasagnas that all our guests get on their first night – I just don’t have the time to make them myself anymore and she does a fabulous job. They ate at Tippy’s, as well as French Leave Bar and Grille – and of course no visit to Governors Harbour would be complete without a trip to Fish Fry on Friday night. Pool floats, floating flamingos and palm trees – all you need is a cocktail ! Jerry Salvi – the organizer of his wife Celine’s birthday celebration trip also engaged the services of Tia and Liam Seyfert. Their company – Out Island Management – can organize just about anything including weddings. Their main tasks were to set up 18 beach chairs and umbrellas on whatever beach was most sheltered on that particular day – and also and very importantly to supply a couple of large coolers full of beer – and replenish as necessary. Tia supplied provisions to all 3 houses prior to our guests arriving and often went to shop for more as needed. 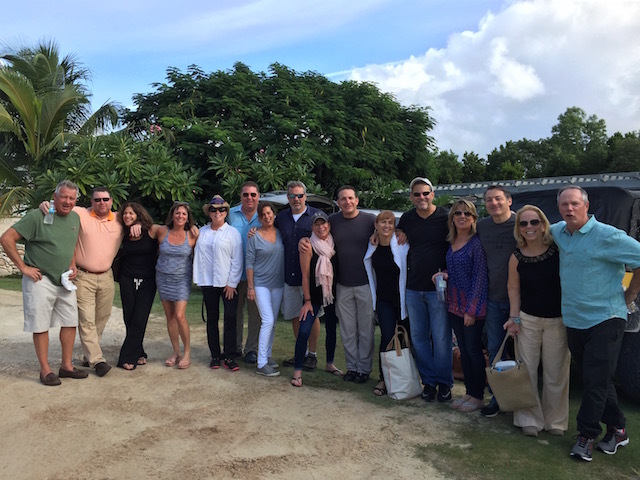 Several of the group visited Harbour Island one day while some others only made it as far as The Cove – eating a delicious lunch there and enjoying the beautiful setting….. The week went with a terrific swing and even a few days of poor weather did nothing to dampen their spirits. Joe Louis enjoying a relaxing time at the beach with the party people ! and thanks to Margaret DenBlaker for the picture…. There is something uplifting in seeing a group of friends have a great time – they laughed and drank and ate and sang – what more can you ask for to celebrate a birthday ? Oh and they took Joe Louis under their wings and gave him a great time as well. One night he pulled an all-nighter and had a sleepover at Tops !! !